You are here: Home / I Forgot To Pick A Category / And another week goes by. And another week goes by. So this week one of the thing we did was work a little more in the old office peeling wallpaper off. The top printed layer comes off in one piece, leaving the brown backing. I have to wipe that down, but not so much it makes plaster fall off. At least they had painted underneath before papering – in most spots anyway. I did remember to cal my aunt and tell her I had a pile of Fimo here for her and she came down the next day to pick it up. She brought Ron a big basket of beautifully arranged old fashioned molasses cookies, because over Christmas he didn’t make it up to her place. Yes, she spoils him rotten! Anyway, she was overjoyed at the amount of stuff I gave her, plus two large books to loan out. 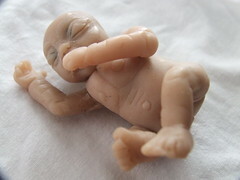 She brought a little wee baby she made, but was dismayed to find his arm broke in her purse. oops. She’s still *really* talented though, see? And then on Friday afternoon, I went to Sew With Jo because regardless of what I had or had not accomplished during my work week, it was definitely a full and productive week. I find the breaks do wonders, really. I made progress on a couple quilt tops, and started quilting a baby quilt. I also met a few more quilters, inviting me to the quilt guild. OKAY UNIVERSE I HEAR YOU. As God as my witness, I will never use polyester quilt batt again. For this quilt, I just took the top & back & pins to the store, bought the batting, laid it out in the back room on their awesome huge table, pin basted it and quilted away. Jo also let me use her little tool for helping with pin basting and of course now I need one. (not want, neeeeed.) 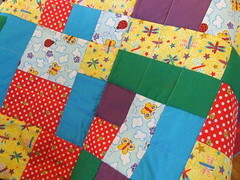 The batting I used on this quilt is Quilters Dream Green, made from recycled pop bottles. It has a faint green tinge, so I wouldn’t use it with a white quilt, but it is so soft and so easy to work with. I love it. I picked up a cotton batt as well, becasue there’s some new babies over in Cousin land who are without family quilts, so I need to get cracking. After I came home, fed my poor starving family, and worked for a couple more hours, I set my machine back up and finished the section of quilting I was working on. Yes, it’s for Isabella, and yes Kaytlyn has seen the top before, but not what I picked for the back. I had an idea to finish it before Christmas, but you see how that worked out. A preview pic posted not as a surprise killer, but visit incentive. (Their car is having issues. Pooh. 🙁 ) I’m thinking in a couple weeks I just might have to make up an excuse to go to Fredericton anyway. Like, to deliver a quilt.